An easier way to talk about a tough subject. Talk about personal feelings and common frustrations. A novel approach to addiction and recovery. Inspire new ways to think about addiction and recovery. 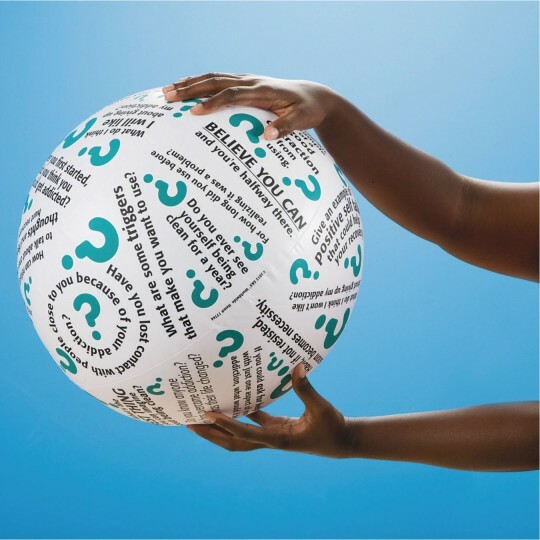 The questions, quotes and positive affirmations printed on this 24" inflatable ball help lead conversations about personal feelings, common frustrations and tactics to control addictive impulses. Get your group to open up with questions and affirmations like, "What are some triggers that make you want to use?" and "Believe you can and you're halfway there." Perfect for one-on one sessions or group activities. Easily adapted for all age and functioning levels. Includes a handy activity sheet with ideas for play and a repair patch.